Anyone who ever visited Las Vegas before about 1990 will forever associate that City of Glitter with neon. 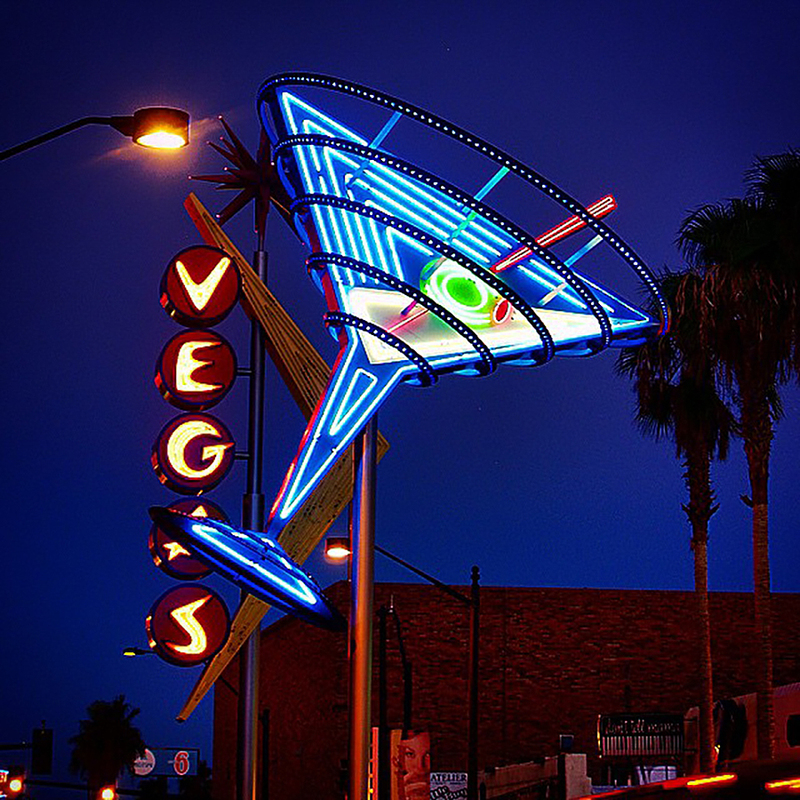 I hope this photo of Oscar’s Neon Martini Glass will take you back to that time when neon was the very symbol of Las Vegas—flashing, glittering, dancing neon, lighting up the fronts of buildings, illuminating the sky, and enticing passers-by to come on in. It’s fun in here. It’s exciting. Join us! And bring your money! Oscar’s Neon Martini Glass glows against a deep blue desert twilight sky, beckoning visitors to old downtown Las Vegas. Though neon was first shown off to the world at the 1893 Chicago World’s Fair, it wasn’t until 1929 that the first-ever neon to greet visitors to Sin City appeared at the Oasis Café on Fremont Street. But then it took off, limited only by the over-the-top imagination of Las Vegas entrepreneurs. Oscar’s Neon Martini Glass, though not old, recalls that treasured Vegas “look” and atmosphere. When I was a kid growing up in southern California, my mom loved Las Vegas. We always took a family road-trip vacation every summer—to Grand Canyon, Idaho, Vancouver, and/or points beyond, but it seemed like wherever we headed, north, south or east, Las Vegas was always “on the way” and was always where we spent our first night. I remember the excitement of seeing the city on the horizon, rising from the dust of the long road from Los Angeles, telling us we could soon get out of our Mercury station wagon “woody” and stretch our cramped legs. From all those family trips in the ‘50s and early ‘60s, I remember most clearly the façade of the old Mint Hotel and Casino in downtown Las Vegas on Fremont Street. It featured a huge marquee-type “wave” all lit up in, of course, mint green neon. I can see it flashing across the top of the building in my mind’s eye to this day. But neon, with its need for very specialized gas-filled tubes, was expensive and hard to maintain. When viable alternatives began to appear, casino, hotel and other business owners pounced. Gradually the neon lights of Vegas were replaced by LED lights and giant LCD screens. The neon all but disappeared. Fortunately, The Neon Museum, near downtown, has collected dozens of classic pieces of old Vegas neon. Most have not been restored (and probably won’t be) but can be visited in the area called The Boneyard, a sort of graveyard for these eclectic electric fossils piled up higgledy-piggledy. They will make your camera cry out and your shutter finger itch to capture them. Some of the best neon has, in fact, been restored and remounted along a Neon Gallery on Fremont Street and Las Vegas Blvd. downtown. These can be seen at any time, but are best viewed at night, when the pure neon colors still glow rich against a deep blue desert sky. Look for a good collection on East Fremont, just past the end of the enormous LED ceiling screen of the Fremont Street Experience. Oscar’s Neon Martini Glass shown here, though it is mounted on East Fremont along with many of the other renovated signs in the “gallery,” is not actually a restored vintage sign. It was created new a few years ago. It was named for the long-time mayor of Las Vegas, Oscar Goodman. Some of the other neon signs you can see in the open-air gallery include the golden magical lamp from the old Aladdin Hotel and Casino, all a-sparkle in yellow, and a prancing horse and rider from the long-gone Hacienda Hotel. That one is mounted on a pole at the intersection of Fremont St. and Las Vegas Blvd. A visit to downtown Las Vegas is always fun, fanciful and full of light. The massive overhead light show that flickers across the giant LCD screen “ceiling” of The Fremont Street Experience is something everyone should see once. Then wander a couple of blocks further and check out some of the beautiful new and restored neon, like this Neon Martini Glass, that brings a bit of old Vegas back to life. The Mint in Las Vegas in 1959. Just for an extra bit of fun and Vegas nostalgia, I’ve added a second photo. 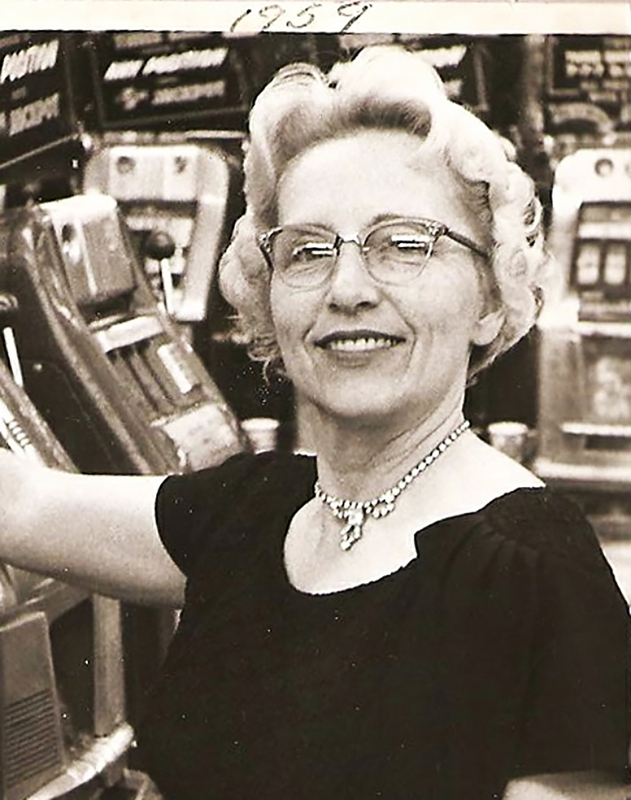 This is my mom, seated at one of her beloved slot machines, in 1959. It was likely taken at The Mint or the Golden Nugget. The casinos used to send “camera girls” around to take pictures of the players. I don’t recall if you had to pay for a copy of if they were given out as souvenirs to entice you to come back. In any case, I have quite a collection of my pretty mom with this same big smile on her face. You can pretty much track the years by her changing hairstyles! I imagine more than a few of us mature Nomad Women remember back in the day when you actually had to put a coin in the slot and pull the handle of the “one-armed bandit.” My mom would end the evening with her fingers black from the nickels and dimes and her right arm sore! But with a huge grin on her face. While you’re in the downtown area, be sure to make a stop at Luv-It Frozen Custard for a sweet frozen treat you won’t soon forget, especially if it is a hot day or evening. Open till 10 pm Sunday through Thursday, till 11 on Friday and Saturday. For more information on the Neon Museum, including how and when you can visit The Boneyard, check The Neon Museum website. I just moved to vegas. I’m definitely going to add these places to my list of things to check out. Thanks for the recommendation! I just loved walking through the Neon Museum the last time I was in Las Vegas. It’s great that they’ve resurrected the old sign (at least in design) and how I wish I had a picture of my mom at the slots. She and dad took us for many a ‘family’ vacation over the years. Fun stuff! The only thing I remember from my trip to Las Vegas (as a child) was the unbearable heat! I loved the swimming pool! The photo of your mother is stunning! Yes, the heat! We made it a point to always stay someplace with a pool. My sister and I always hit the pool first thing. Thanks for the comment on my mom, She was so pretty. We lost her last year… at 97! Hello,I wanted to thank you so VERY much for this list of plaecs in Vegas for a photoshoot. I come from Oregon and it’s quite beautiful every where you go. Def a difference here with dirt and rock. I was struggling to find a place to bring my own props instead of the same old boring shoots at JCP. We have chosen the Orchid and another friend upon sharing this info has booked the neon for their engagement photos. Thank you!!! I love a vacation in Vegas. Got engaged there and married there and had a class reunion there. It was much easier to get to when I lived in Denver. I have heard much about the neon boneyard but not yet visited. I enjoy the nostalgia of old Vegas on Fremont Street and always take a day or two to wander there. That is a hgreat shot of your mom. Thanks for sharing. Are they trying to put me off my feed?